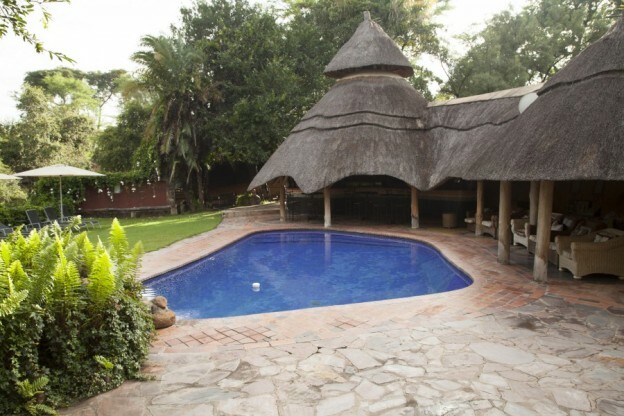 Pamuzinda Safari Lodge is located 87 kilometres from Harare, Zimbabwe’s capital city. It is a popular weekend destination for the city’s residents. 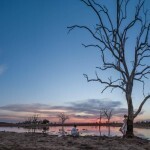 Also, thanks to its relative proximity to Harare’s airport, the lodge represents an opportunity for international travellers to immerse themselves in a traditional bush setting on the night after a flight or, for one last time, prior to departing. I arrived at the lodge on the evening of Good Friday, a day that sees a mass exodus of residents from Harare for the long weekend. Jerry, the ever-smiling driver of the mini-bus in which I toured Zimbabwe, assured the dozen of us travelling with him that the roads between Harare and Selous were unusually busy on the day that we travelled. There was still time for a buffet dinner in Pamuzinda’s spacious, open-sided dining room before heading to bed. The communal buildings of Pamuzinda Safari Lodge impressed because of their size and eco-friendly design. Their sweeping roofs made from natural materials: thatched roofing is something I most readily associate with the quaint, historic buildings of the Cotswolds and south-west of England. 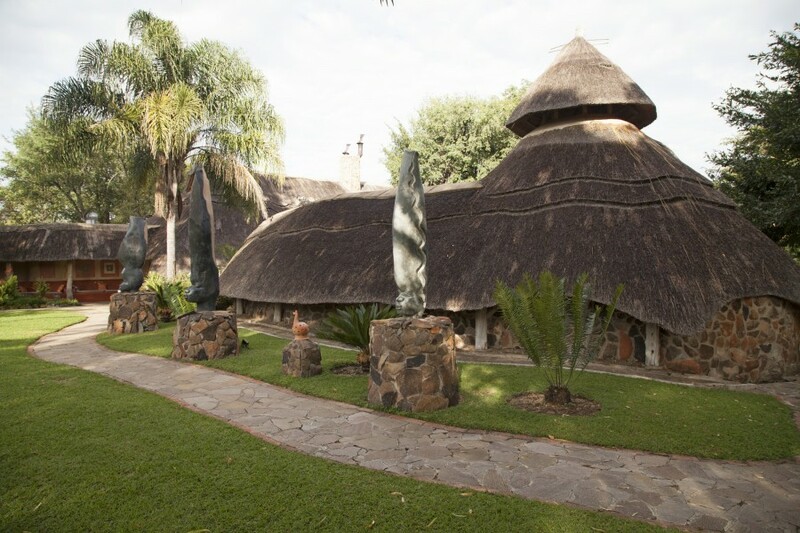 Yet thatching is widely used in the traditional architecture of Zimbabwe: it keeps interiors cool and decked in shade. Outside I noticed stylised stone sculptures of human heads with hairstyles stacked impossibly high. The sculptures were mounted alongside the footpath and neatly tended lawn that led to the thatched cottage in which I spent the night. Outside insects chirped a soft, soporific symphony that soon sent me to sleep. Perhaps it was the soft morning light rather than my alarm that woke me ahead of a morning game drive. Pamuzinda Safari Lodge is set on a vast private estate. 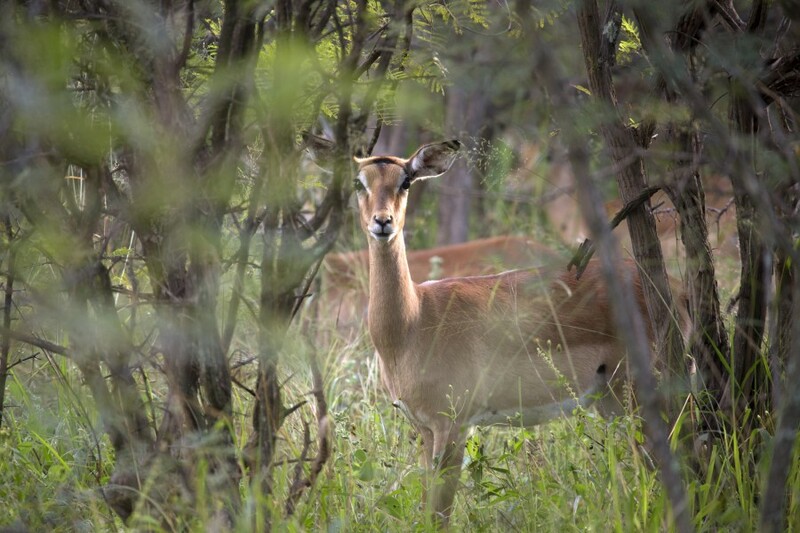 Animals have been reintroduced to the estate in recent years, which has been active as a privately owned safari lodge for over 40 years, though the ownership has changed in that time. “We have giraffes, zebras and wildebeest. We also have elend, kudu, impala and warthogs, baboons and monkeys. 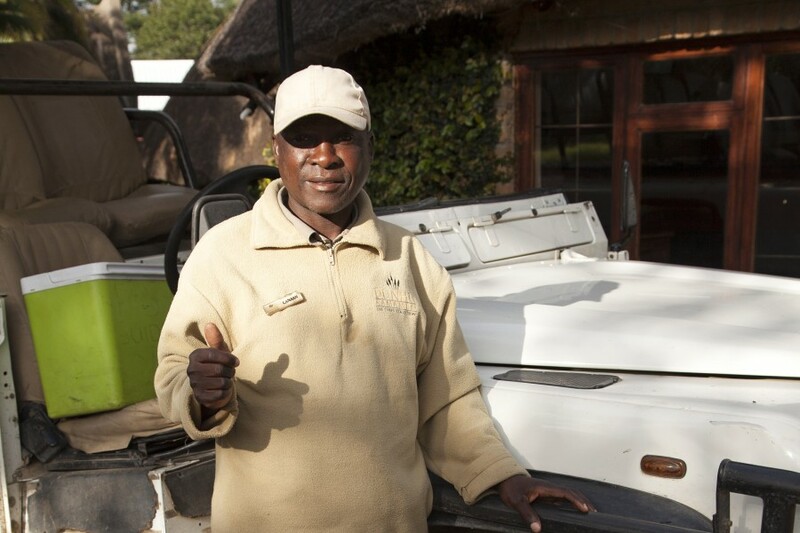 We try to conserve and look after the animals,” explained Canaan, the guide on the game drive. “The animals are breeding well. They don’t have predators, that’s why the population has multiplied,” he added. “I’ve been in this job for 25 years and I’m very much interested in conservation. I like conservation because otherwise, we would end up not having these animals at all. We should look after them so that the new generation has something to see, rather than to read from books, ‘this is the giraffe’ and it is nowhere to be found,” said Canaan with heartfelt emotion. 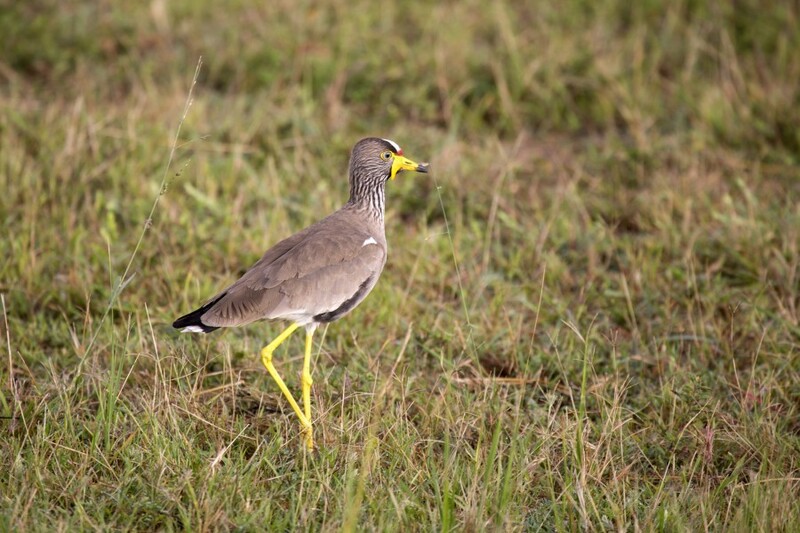 It was from behind the wheel of a Land Rover that he pointed out impala, giraffes and several species of bird as we toured the estate’s tracks with the sun barely above the horizon. 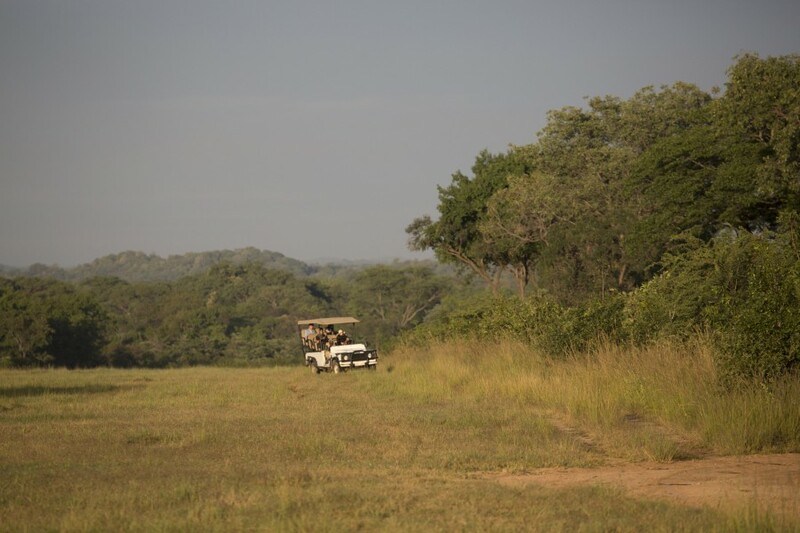 Part of the thrill of a morning game drive is the lush, fresh scent of vegetation in the cool light of the day. March and April represent Zimbabwe’s green season, a time of intermittent rains. The water that falls causes plant life to thrive, making sightings trickier than in the dry season. In part that’s also because an abundance of water means that animals do not need to approach waterholes to find drinking water. After a couple of hours in the back of the Land Rover, we returned to the lodge’s communal buildings for a cooked breakfast. Monkeys, sitting on a nearby tree, watched as we clambered down from the vehicle. Perhaps, to them, waiting outside of Pamuzinda’s dining room is similar to us waiting by a waterhole in the dry season: a way of observing creatures that entertain and fascinate? Learn more about Zimbabwe and the country’s attractions via the Zimbabwe Tourism Authority website. To find out more about Zimbabwean wildlife and national parks, take a look at the Zimparks website. Pamuzinda Safari Lodge is located approximately an hour’s drive south-west of Harare, near Selous, off the A5 highway that runs to Bulawayo. Accommodation is available in 15 individual lodges with en suite bathrooms, thatched roofs and beds draped with mosquito nets. 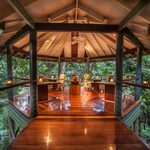 Each of the lodges has a private patio and looks on to the Serui River. 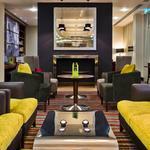 Meals are served in a traditionally furnished, open-sided communal dining room with a terrace that overlooks the river. 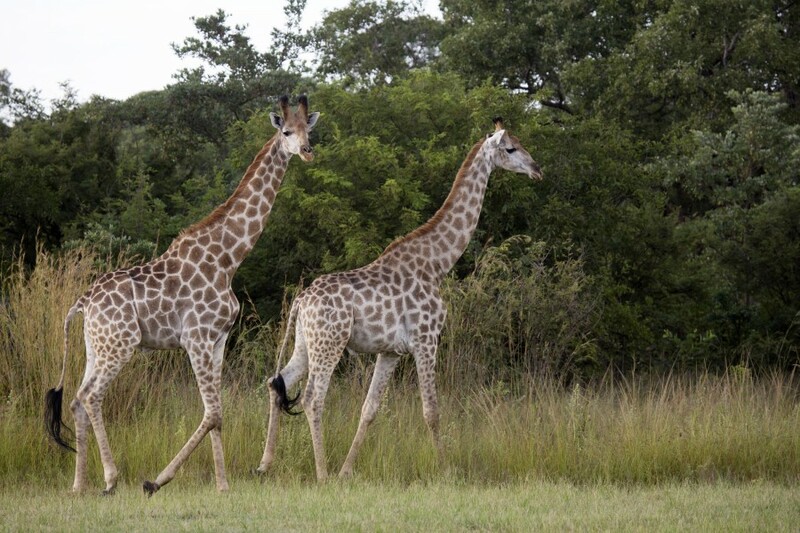 Game drives are offered on Pamuzinda Safari Lodge’s a private estate that encompasses thick bush and savannah habitat. How do I get to Zimbabwe? Rwandair operates flights between London Gatwick and Harare via its hub at Kigali International Airport, Rwanda. The journey also involves a brief stop in Brussels to pick up and set down passengers. Where else might be of interest during a visit to Zimbabwe? The Great Zimbabwe UNESCO World Heritage Site, Victoria Falls, Hwange National Park, Matobo National Park, Lake Kariba and Eastern Highlands are widely regarded to be among the country’s most rewarding destinations for travellers. The country is a year-round tourism destination. For wildlife viewing the dry season (July to November) is regarded a good time to visit, as animal sightings are more likely then. To see the Victoria Falls in full flow, visiting from late March into May is ideal.